EOTD: Light Forest - Cherry Colors - Cosmetics Heaven! Hello everyone! The mess on my hand after application.. As you've read in my previous post, I've got lots of samples today. I wanted to try out the Sweetscents Teal Shimmer, but I didn't want to neglect my Lime Crime eye shadows, so I used two eye shadows from LC too! 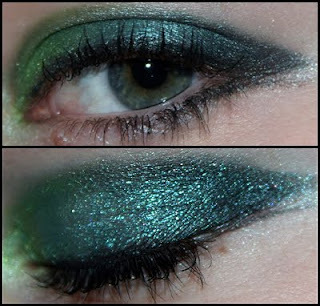 I used: Lime Crime Lime Criminal (super nice bright green) Lime Crime Enchanted (nice dark green, like some trees) Sweetscents Teal Shimmer (in between the blue and green color) This came out: But since I have weird eyes, you can't see well, so I took more photos! :) One in flash and others in sun light. But when it comes to colors, I think the first picture is the most realistic when it comes to colors. 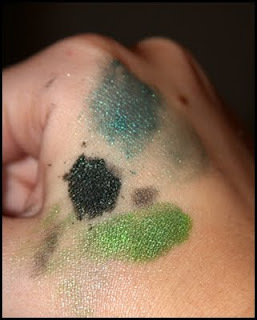 Enchant is a really dark green, that's why I used it as a liner too. Flash: Sun light: I really adore mineral eye shadows. They can be mixed with practically anything. Nail polish, lip glosses, well anything really! I almost always mix them with my Visine, so it stays on for more time and the colors show better. 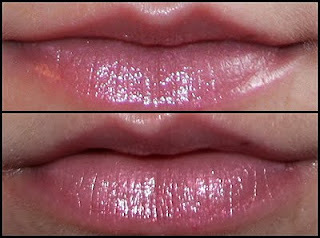 And for the end, here's my lips with Eyeko Fat Balm in Minty. I started to like it..